ABunDance – The Art of Love!! Welcome to the world of A-Bun-Dance, Where Art, Music, and People become ONE! 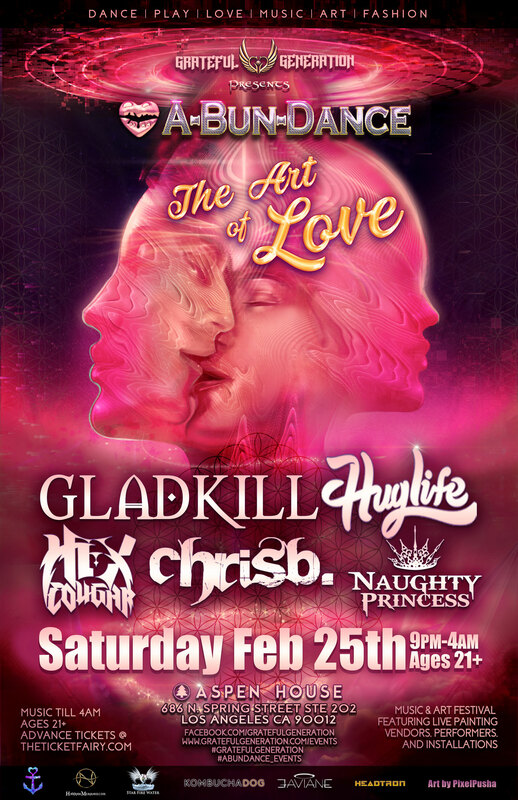 Experience the ART of LOVE at Aspen House with music by Gladkill, Huglife, Hex Cougar, ChrisB., and Naughty Princess! Immerse Yourself in an indoor / outdoor wonderland of Amazing Art, Visuals, Playful Performers, Vibey Vendors, and of course, a Lineup of Epic Music! Explore all the possibilities of being Pure love and transform into the Greatest Gift that you are as your very own work of He(Art)! Grateful Generation welcomes you to a sensational evening of experience and expression in The Art of Love.